Revisionist political thought can be divided into four aspects. First, the revisionist historians inherited a Victorian institutional structure that was still very much in place in the early postwar period, where historians from Oxford and Cambridge enjoyed a privileged opportunity to join the ranks of the British government or the Civil Service. 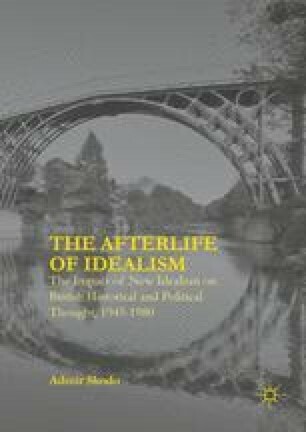 Second, revisionist historians were a significant presence in the discourse on the death or decline of political philosophy, which captured the imagination of Western intellectuals from the 1950s to the early 1970s. What is perhaps most surprising about the revisionists’ engagement in this discourse is their participation in the early debate on human rights. Third, it was not entirely clear in the early postwar era to the European intellectuals who had experienced World War II that the intellectual roots of authoritarianism and totalitarianism had been severed from the European mind by the Allies’ victory. That prompted a number of intellectuals, including the revisionist historians, to probe into the history of totalitarianism and authoritarianism.